DDEChartUpdater allows you to use MetaStock ( or SierraChart ( with data feeds that are not supported originally. The program connects to external programs providing (real-time) quotes via Windows DDE. DDEChartUpdater converts these quotations to MetaStock or SierraChart format. 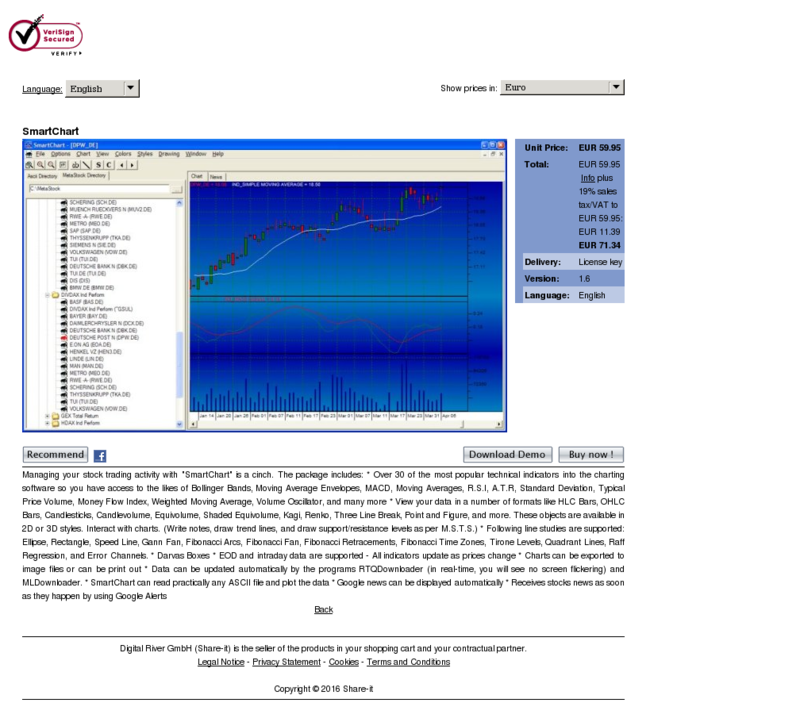 The charts of MetaStock/SierraChart will be refreshed automatically. More features of DDEChartUpdater: You can download data from any source in DDE format directly to MetaStock or SierraChart format. This widens the selections of possible data vendors by several orders of magnitude. You can use as many data vendors as you want. So you can easily combine the advantages of these venders by just configuring the DDEChartUpdater. Convert2MetaStock allows you to to create data in the MetaStockTM or CompuTracTM format from an ASCII historical end-of-day data source file. The ASCII file can practically be in any file format. You can define how your ASCII source is structured, for example: which columns have which fields (date, time, open, close, etc) · what is the column delimiter character · what is the date format In addition, you can define how your output is to be created, for example: · the ticker symbol and name · whether to add the data to an existing ¿master¿ file or create a new one Simply launch the Convert2MS.exe file and select an ASCII text file using the File > Open menu command or the toolbar button. This will load the first 100 lines of your file (as a reminder of what it looks like) and automatically launch a Conversion Settings dialog box. Adjust the settings and hit CONVERT – your new MetaStockTM format file-set will be created. Convert2Ms will also update the MetaStock chart (EOD version or Offline mode) automatically if you have the chart opened in the MetaStock program. MLDownloader downloads intraday, end of day and historical stock quotes, Options and Futures from various Internet sites. The program gives you the option of saving your data in MetaStock or in the form of ASCII files. You are completely free to define your format of the ASCII files, so almost any Technical Analysis software can read it. To bring your data up-to-date simply instruct MLDownloader to perform a data collection for an individual symbol or a symbol list. You can also schedule your downloads. Specify a start time and a list of download symbols, and MLDownloader automatically downloads the data. Optionally you can select an external application that will be started after the download has completed. If you have some days missed, MLDownloader automatically fills the missing days. 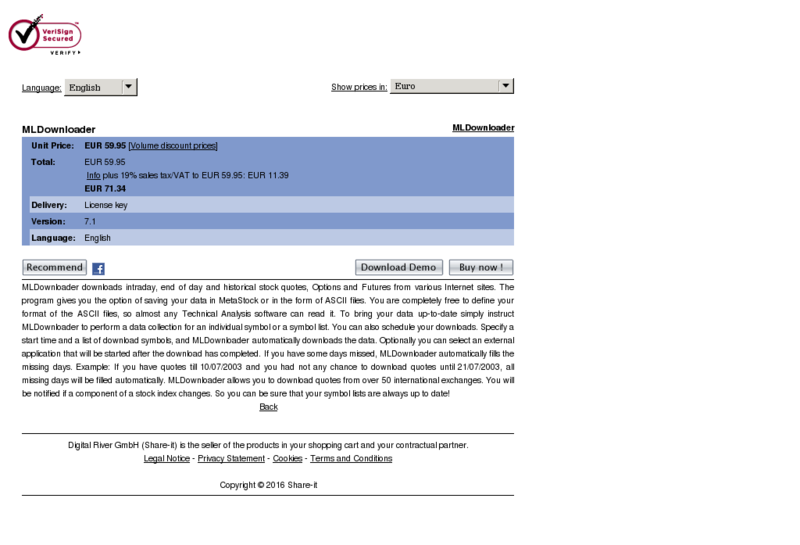 Example: If you have quotes till 10/07/2003 and you had not any chance to download quotes until 21/07/2003, all missing days will be filled automatically. MLDownloader allows you to download quotes from over 50 international exchanges. You will be notified if a component of a stock index changes. So you can be sure that your symbol lists are always up to date!